Rex Swan keeps his prized bull and breeding cows just down the road from the empty Main Street lot that housed the Templeton Livestock Market for nearly 70 years. Swan has spent his life in the cattle breeding business and currently runs a successful seed-stock operation, where he breeds the bulls and cows that other ranchers use to breed their herds. 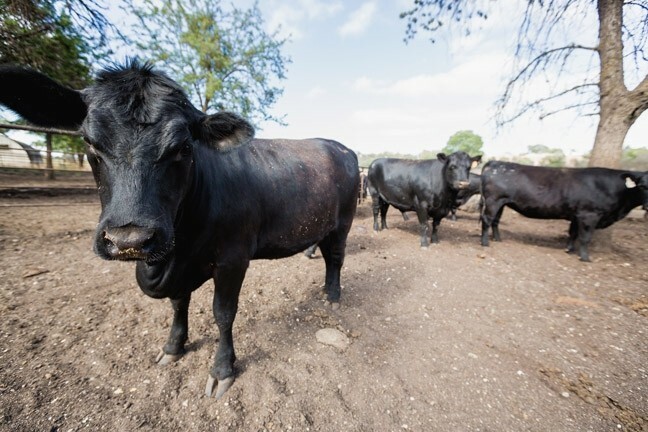 Not all the bulls and cows are born to be breeders, however, and over the years Rex and his wife, KC, became small-scale meat producers, raising livestock to sell locally. As changing times make running cattle an increasingly tough business, Swan is among cattlemen in the area who creatively adapted to stay afloat. The Swans feed their cattle and pigs a mix of byproducts left over from beverage making and other agricultural processes. His go-to mix includes spent grains from brewing beer, almond hulls, and wine silage. “Years ago, it became plain in major industry-wide statements that everyone in agriculture needed to be a least-cost producer,” Swan said, referring to the need to cut costs to stay in business. He looked to see what “abundant resources” and “abundant crop residues,” or cheap and plentiful resources, were available in the area. Using almond hulls and spent beer-making grains has long been common practice, but the use of byproducts from winemaking was a new discovery for them. The skins and seeds left after white wine grapes get crushed (red wine grapes can’t be used as they contain too much alcohol) are stored in an air-tight enclosure for a few months until the walls of the grape seeds break down, which takes a seed from 95 percent indigestible to 95 percent digestible. Swan picks up spent barley malt from the Paso Robles Firestone Walker Brewery, which he’s done for 17 years, since before it was Firestone. “We’ve evolved into a trucking outfit,” Swan joked, saying that it’s becoming difficult to keep up with the output left from the brewery’s increasing production. That arrangement has worked well for both parties, where one man’s waste is another man’s cattle feed. LEFTOVERS: Rex Swan feeds his cattle a mix of almond hulls, skins and seeds from wine grapes, and spent barley left over from brewing beer. “In any industrial process there is going to be a waste stream, and the name of the game is minimizing that,” said Matt Brynildson, Firestone Walker’s brewmaster. Brynildson said he’s delighted that a large chunk of the brewery’s waste stream is not only picked up and put to use, but that it’s still useable. Swan’s innovative use of byproduct as feed—and their direct, local marketing approach—has worked well thus far. Their beef, sold under the Swan Family Angus label, is processed at J&R Meats in Templeton and sold to local restaurants and markets. With the help of the nutritious grapeseed, the beef is high in Omega 3 and conjugated linoleic acids, Swan said. Swan’s approach also helped their business weather the intense drought. As California reels in its fourth year of record-setting drought, keeping cattle has been a tough go for ranchers. There’s little to no grass on the ground and hay prices skyrocketed after demand increased and production decreased, also due to drought. Grain and corn prices are also up. Ranchers basically have two choices—buy expensive hay and try to hang on until the rain returns, or to cull—reduce the size of—and sell off their herds. 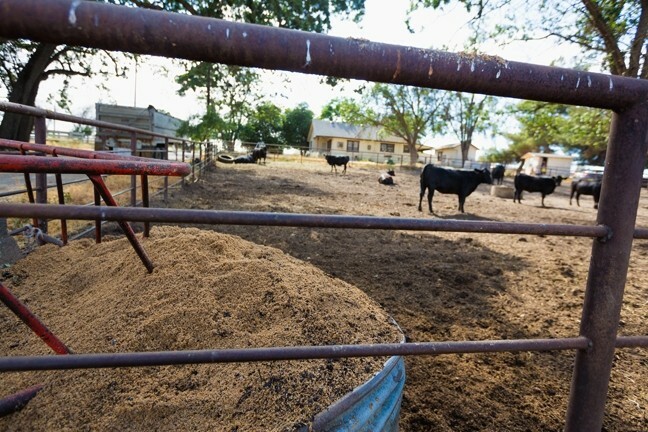 Some ranchers sold off part of their herds early and cashed in on high beef prices, while others spent a fortune on feed for the first three years, only to finally reckon with the fact that the drought may be here to stay. “When everyone else was having to pay $280 for hay, we had a $62 hay equivalent,” Swan said. Swan isn’t the only producer who uses byproducts, which are commonly used in small operations that can’t depend on swaths of rangeland. Dairy farmers in Salinas might feed their cows protein-rich leftovers from broccoli and artichoke farms. “Whatever is around you, you want to check it out and get it analyzed,” KC said. Swan’s propensity to always look for something better, however, keeps him curious and experimenting. Currently, he’s working on what he called an “exciting theory”—concocting a sort of “super milk” to feed his livestock. The idea is to try mixing leftover whey he gets from Central Coast Creamery with trube, a protein-rich liquid residue from beer making; high-fat residue from turning cooking oil into biodiesel; and the flour-like substance collected from Firestone Walker’s dust fans. Swan’s hoping the end result will be a protein-rich, high-fat milk, an idea that he said was inspired by elephant seals, who produce milk with 12 percent fat.